What are the Best Low Fat Dog Foods? How To Find The Best Low Fat Dog Food? What Constitutes Low-Fat Diets For Dogs? When A Dog Needs Low Fat Food? How To Make Sure That Your Dog’s Nutritional Needs Are Met? Contrary to our common beliefs that all fats are bad in order to provide a good nutritional balance, every dog food should contain good fats. An adult dog requires a diet that contains at least 5% of fats, and the recommended amount is between 9% and 15%. With that being said, some dogs do benefit from eating low-fat food. These are dogs who need to lose weight, have gastrointestinal problems or pancreatitis. Not all low-fat dog foods are able to provide balanced nutrition for your dog. We came up with this guide in order to help you find the best low-fat dog food that has all the required nutrients and will help with your dog’s health problems. Best Low Fat Dry Dog Food: This high-quality formula contains healthy antioxidants, vitamins, and minerals that are there to maintain your dog’s health and the quality of his joint. This low-fat dog food was mainly designed to help dogs lose and maintain weight. Since this formula has 9% of fats from chicken fat and flaxseed it is also recommended as a low-fat diet for dogs who have troubles with digestion. Also, it contains 5% fibers from easily digestible ingredients like spinach, kelp, white rice and will ease stomach problems. The main feature of this low-fat dog food is 28% of crude proteins and the real chicken as the primary protein source. This high protein low-fat food ain’t cheap but you can be sure that you are getting all of your money’s worth with this well-balanced food for daily feeding. Best Low Fat Low Protein Dog Food: Blue Buffalo healthy weight formula is made in the US from the quality and fresh ingredients and its main source of protein are deboned chicken. Without chicken by-products meals, this is primarily a low-fat formula for weight loss and management. What makes this formula suitable for dogs with stomach problems are high contents of fibers. Easily digestible grains like brown rice, barley and oatmeal will help soothe stomach pains. This formula contains sufficient amounts of flaxseed and chicken fat that are the main source of omega 3 and 6 fatty acids. They serve as the main source of energy, but will also maintain the quality of your dog’s skin and coat. This low-fat food has “cold-formed bits” specially cooked on lower temperatures so all the essential nutrients from fruits and vegetables would find their way into your dog’s stomach. All the necessary minerals, antioxidants and vitamins are present, so this is a well-balanced formula for everyday feeding. Best Low Fat Grain Free Dog Food: Wellness is one of the best dog food brands and it’s famous for making high-quality dog food with fresh meat as the number one ingredient. They offer several lines of products designed to meet all the nutritional requirements for dogs. CORE Reduced fat formula still has a high protein content despite having 25% less fat than CORE Original. The first ingredient of this low-fat dog food is deboned turkey followed by turkey meal, chicken meal, and turkey livers. Chicken fat, flaxseed, and salmon oil are the key providers of healthy fats at low levels. Fruits like apples and blueberries are included in this formula to provide all the necessary vitamins. Probably the main feature of this low-fat dog food formula is that its grain free, and contains only premium quality easily digestible fibers. Spinach, broccoli, parsley, and sweet potatoes are easy to digest and perfect for dogs who have gastrointestinal problems and pancreatitis. Low Fat Dog Food Pancreatitis: This low-fat high protein dog food has a 35% less fat than Eagle Pack’s original formula without losing the quality of meat-based proteins. Pork meal, chicken meal and turkey meal are the main protein ingredients that also provide that meaty flavor all dogs love. This low grain formula contains peas, ground brown rice, oatmeal and rice that are easy to digest and soothing for the gastrointestinal tract. With 4% crude fibers this formula will not provoke any allergies in skin sensitive dogs. Flaxseed and chicken fat are present in this reduced fat formula in just the right amount of maximum of 9% to support skin and coat health. This amount of fat makes this food easy to digest for dogs who have pancreatitis problems. The reduced fat formula is reinforced with glucosamine hydrochloride to maintain joint health and all necessary vitamins and minerals for a healthy immune system. Low Fat High Fiber Dog Food: This is a fat-restricted diet specially made to help dogs who have difficulties digesting fats. This formula had to sacrifice its sources of meat-based proteins in order to make this low-fat low fiber formula. Royal Canin gastrointestinal low-fat dog food was created bearing in mind the specific needs of dogs who are suffering from gastrointestinal upsets and have a sensitive stomach. And although it’s one of the formulas with the lowest fat counts its equipped with all the necessary nutrients for a balanced diet. Wheat and barley are complex carbohydrate sources that are combined with prebiotics that help with the digestion of low-fat dog food for pancreatitis affected dogs who have troubles digesting food and fats. With 20% of crude protein, 4.5% to 8.5% of crude fats and only 3.6% of fibers this a great formula with a competitive price designed only for dogs who have stomach problems. This low-fat dog food comes in three different sizes and there is also a canned version, for owners and dogs who prefer that type of food. Before you start looking at brands that make the top-rated low-fat dog foods you should make sure that your dog can benefit from this type of diet. Talk to your veterinarian, if he thinks that the change to lower fat food will have benefits for your dog’s health we are here to make your search easier. 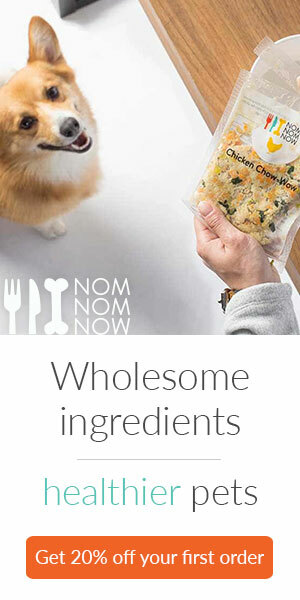 Whole Dog Journal one of the key providers of useful information on healthy feeding habits, deem all dog foods that have less than 10% fats, as low-fat dog foods. But if you research a little you will see that the number one source of information about canine nutrition, considers foods with 12% fat or less as low-fat dog food. Be aware of these percentage numbers when you are shopping for low-fat dog food. An extremely low-fat diet can cause serious health problems, and impact the state of your dog’s coat and skin. It is always best to ask your veterinarian and take his recommendation into account when you are looking for low-fat dog food. In some cases when it isn’t necessary to cut the amount of fat, many dogs experience constant hunger, lack of energy and their overall health is affected. Low-fat food is recommended only for dogs who are suffering from certain health problems, and if your dog is healthy there is no need for him to eat low-fat dog food. Pancreatitis is an inflammatory disease that affects the pancreas and his ability to help with food digestion. Potential causes of pancreatitis are a sudden intake of high-fat food, genetics, hyperlipidemia, or breed type. Obesity requires a lower calorie intake, low-fat dog food has fewer calories and it’s sometimes recommended for dogs who need to lose weight. The sensitive stomach can be caused by fat-rich foods. Fats are harder to digest than proteins, and when a dog is eating lots of fats he can vomit or have a loose stool. Dog nutritionists advise that a homemade diet for a dog who is suffering from pancreatitis contains skinless white meat chicken, non-fat cottage cheese, egg whites, beef liver or ground beef. Also cooked vegetables like sweet potatoes, broccoli and cabbage are easy to digest. When you start researching different food brands you will notice that most of them advertise their food as best low-fat canned dog food, easily digestible or grain-free, but most of them aren’t. We will tell you what to look for in order to find a well-balanced low-fat dog food. Look for normal levels of proteins that are derived from high-quality meat. Meat should always be the first ingredient. Stay away from low-fat low protein dog food, unless you were advised otherwise by your veterinarian. Look for low-fat grain free dog food that is easy to digest. Stay away from low-fat foods that have high levels of carbohydrates. Check fiber levels, since low-fat high fiber dog food is good for pancreatitis. Look for animal-based fat as the primary source of fat. Flaxseed and coconut oil needs to be secondary sources of fat. The food formula shouldn’t contain additives, added colors or flavors. Look for vitamins, minerals, and prebiotics that will maintain the immune system. It is our recommendation to consult your veterinarian before deciding to place your dog on a low-fat diet. Best low-fat dog food is designed to help dogs who have gastrointestinal problems, sensitive stomach or pancreatitis. If your dog doesn’t have any of these problems and just needs to lose weight there are other food options that have higher levels of protein and will give better results. Remember that every dog should have balanced nutrition and that fats are the main source of energy for dogs. If you are looking for a dog food that will help your dog lose weight check our articles about best dog food for weight loss and some recommendations for the best dog food for diabetic dogs. And don’t forget that your dog also needs exercises in order to lose weight.